Learning to play AND love hockey is the focus of the Sand Sharks clinic. Using age and skill appropriate drills, our coaches work with participants to feel comfortable on the ice, learn hockey fundamentals and most importantly, have fun, so they want to come back each week. Given the age, attention span, range of skill levels and varied pace of learning, the girls are sorted into groups to allow coaches to tailor stations and drills to ability. Games and engaging activities are used to refine basic motor patterns required to play hockey. Concepts of cooperation, teamwork, fair play and sportsmanship are introduced. The first step is getting the participants comfortable in skates and falling along with learning beginning skating techniques. Ice Scooters and other aids help beginners with balance and confidence. Hockey basics are introduced including stance, stride, knee bend, use of edges and backwards skating. Pucks and sticks are added along with small cross-ice games to put it together. The clinic ends with a “field day” on the ice at which participants have fun while demonstrating their hockey and celebrate with a pizza party! Bill Greim, our Sand Sharks Head Instructor and overall Clinic Director, has played and coached hockey for most of his life. 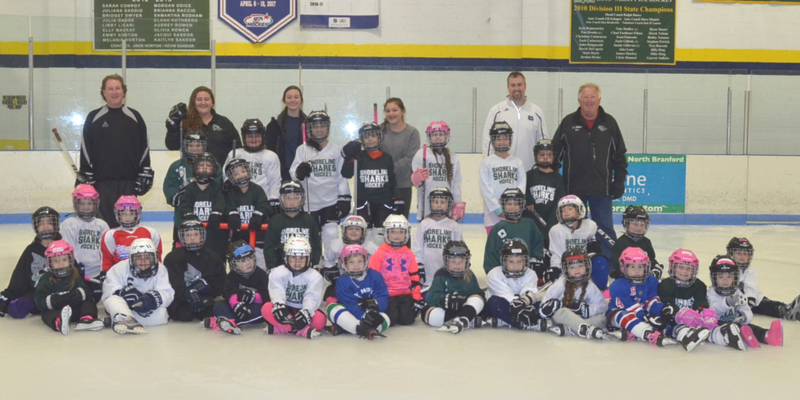 His passion for the sport and tireless dedication have greatly impacted girl’s hockey in Connecticut. Bill co-founded the Shoreline Sharks (2000) Connecticut Girl hockey League (2005) and the Guilford High School girls hockey program (1998) for which he coached for many years. He served as President of the Sharks for 17, helping the organization grow from one travel team to 11 plus our two development clinics. Without a doubt, his favorite day of the week is Sundays, when he takes the ice with the Sand Sharks! Each week, there are 4-5 adult Shoreline Sharks coaches on the ice supporting Bill along with player volunteers. All of our adult coaches are registered with USA Hockey and certified through their Coaching Education Program. They have also passed SafeSport Training and a background check.